Mother’s Day is always celebrated on the second Sunday in May and is this coming Sunday. It’s not a federal holiday, however it’s widely celebrated as a special day to honor all mothers. It’s a day to honor the women who raised and sacrificed for us. Mother’s Day originated in 1907. Anna M. Jarvis conceived the idea of an annual nationwide celebration and in 1914, President Woodrow Wilson signed a proclamation designating the second Sunday in May Mother’s Day. How do you celebrate your Mom? Breakfast in bed? A beautiful bouquet of flowers? A handmade gift? Have you ever considered air conditioning? What’s better than the gift of a comfortable home on hot summer days in Northeast Ohio? It’s a gift that she can enjoy for many years to come. And with Mother’s Day celebrated in May, summer is right around the corner so it’s the perfect time to enjoy central air conditioning! Verne & Ellsworth Hann, located in Cleveland Heights, has been installing air conditioning for mothers for over 63 years. Servicing Cleveland Heights, Shaker Heights, University Heights, Beachwood, Lyndhurst, most of Northeast Ohio and branching out into Lake and Geauga counties, Verne & Ellsworth Hann is a 5 generation company owned and operated by brothers Bill and Chris Hann. 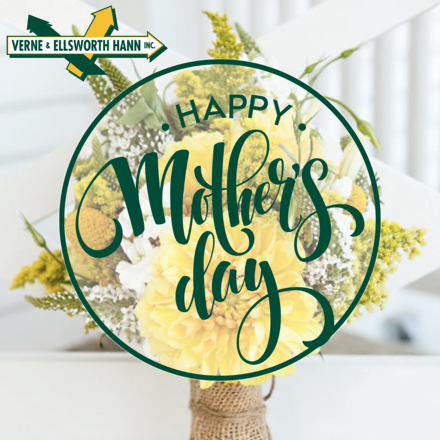 Everyone at Verne & Ellsworth Hann would like to wish all mothers a happy Mother’s Day! Give us a call at 216-932-9755 to inquire about air conditioning installation today!